Purl, assumes a formlessness of its own. 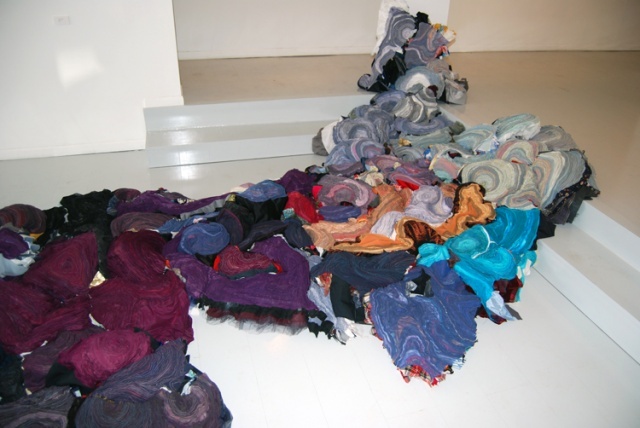 Undulating down the gallery steps and across the floor, Purl, is comprised of modular components which, in turn, are made of layers of cloth built-up under a stitched/drawn surface. 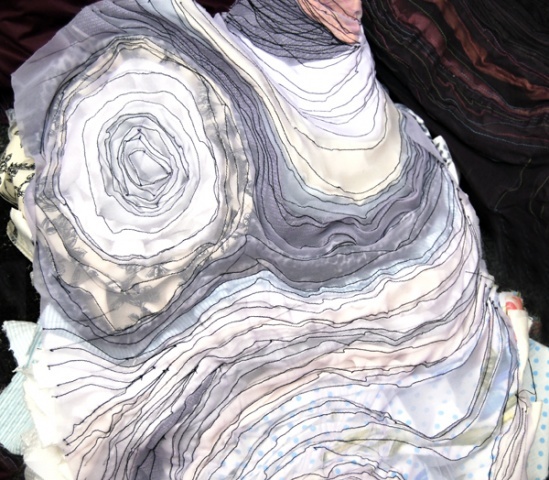 While the top fabric is new, the under layers revealed through the translucent surface reflect a longer history, and one that is not solely the artist’s. 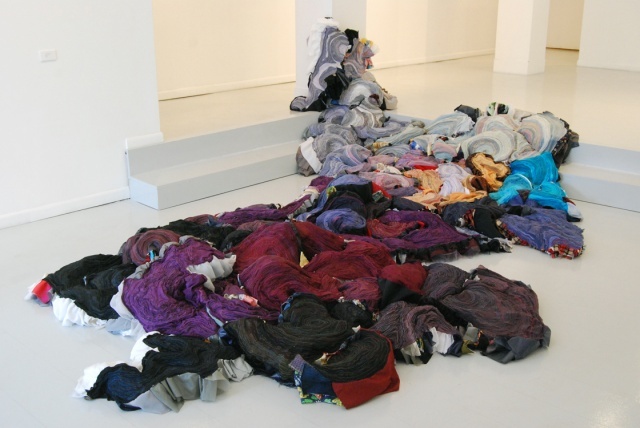 Honchell received a large donation of fabric and clothing from the son of a woman who was an avid sewer, although the artist and the donor never met. 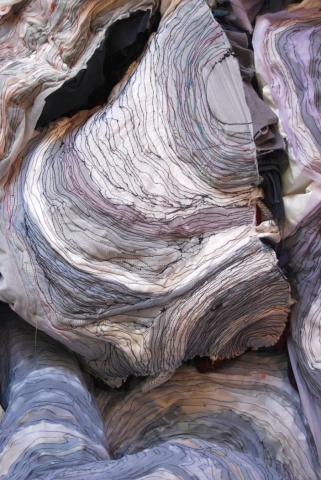 Thus, the found history of another maker has given life to Honchell’s piece. She thinks of it as something akin to organ donation. “I was really struggling in my studio before I received this gift. It revitalized my practice and made me feel intimately connected to someone I will never meet. 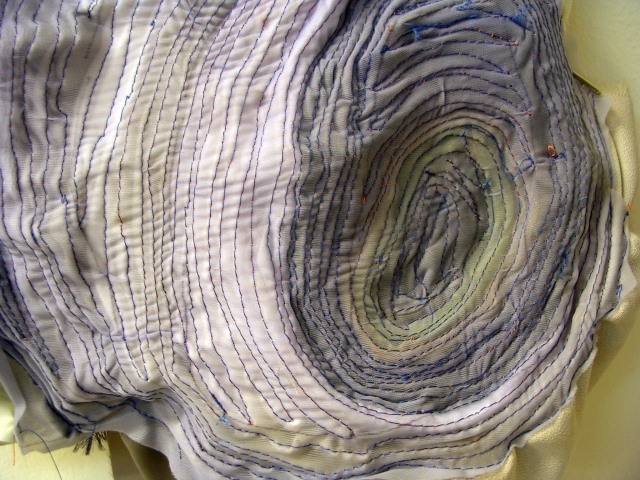 I am grateful to and curious about the woman whose cloth and garments literally built up this piece.” Purl is an intimate mingling of two women’s sewing practices, one supporting the other. Honchell explains that the title means, “to move in ripples or with a murmuring sound, to run or rise in circles or eddies, to swirl. 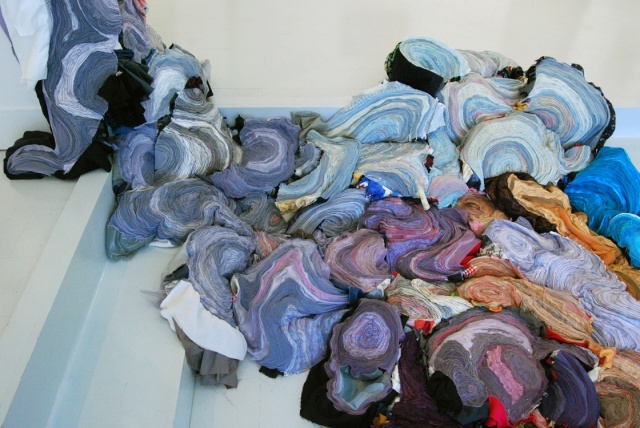 It is also the name of a stitch used when knitting, and the top fabrics used in this piece are all elasticized knits.” She uses a stitched line to connect the cloths, and to draw parallels between landscape, topography, and the body. 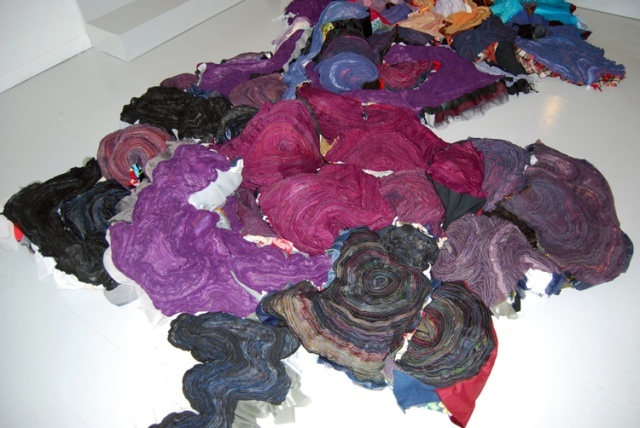 Honchell researched fashion color trending for fall 2007/winter 2008 to determine the palate of the top cloths. 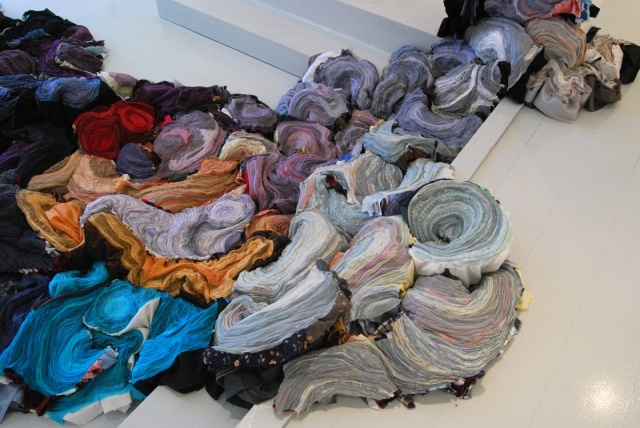 The current color trends reflected on the surface exist in contrast the layers below. One can discover a forty-year history of American plaids, disco-era prints, and quaint country calicos just beneath the smooth surface. Purple, a color often described as regal, ornate, imperial, and elaborate, features prominently in the top layer, adding a sense of import to the eccentric archive of cloth underneath. The color shift that occurs on the surface of Purl hints at many things from purple mountains (majesty?) to the fading of a bruise just beneath the surface of your skin.